Very Good West ! That is the first Factory documentation I have seen. 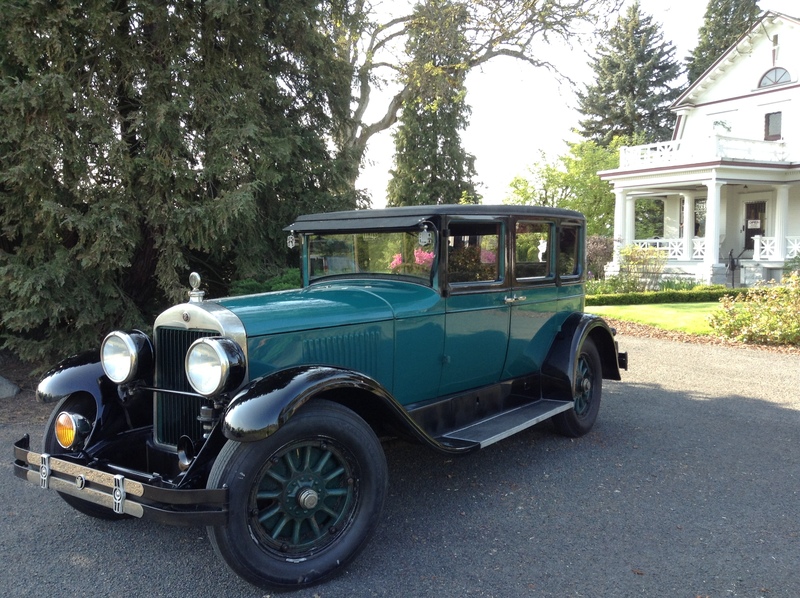 I'll bet THAT style of Trippe light is in demand with 32 Packard owners. Two headlights, two taillights , dash lights , and a pair of Tripp's will definitely peg the amp meter on full discharge. At least it does on my 34 Auburn phaeton. OK I accomplished a very scientific survey of Lorraine verses Trippes. My findings all calculated in shows the results are 9 Lorraine verses 21 Trippes. Now how do you ask I came up with that number? 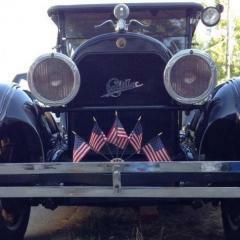 I did a count on the cars at the Gilmore Museum gathering with CCCA 2015 the year of the Packard. I am not saying what is correct but there is a substantial number of over 2 to 1 pre 1937 that have Trippe on there cars. 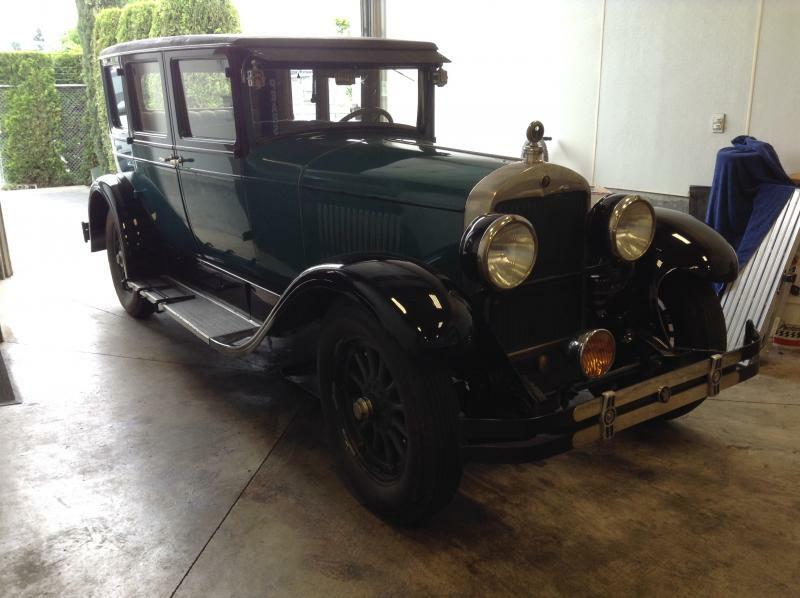 I also noticed a 1924 Packard with Lorraines but for my taste they were a bit large. My belief is they were available and maybe not as a factory or dealer accessory but through a jobber. They should be a accepted as a safety feature seeing the original headlights are not adequate after dark . I don't think the manufacturer's catalogs should be viewed as the definitive guide on what is historically accurate or not. Restoring a vehicle is not necessarily about following a manufacturer's original specs, but is instead about making the car period-accurate. Trippe Light was one of the major manufacturers of accessory lights and were very common. The demand for Trippes fell with the advent of high beams, as all cars essentially had extra-bright lights built-in, but before that time they were a common sight for roughly three decades. To say that Trippes, or any other accessory not listed in a catalog, doesn't belong on a true classic is to view history through a very narrow lens. You might as well throw out all non-sanctioned trunks on cars that only shipped with luggage racks, all custom-made tops, aftermarket carburetors, etc. One of my favorite things about car from the 1920s and 1930s is that the car industry was still a free-for-all with lots of little companies in the heartland of this country making all sorts of novel accessories, add-ons, and glitzy bits of a chrome for enthusiastic car buyers. To me, that's part of the charm. And it's not just me. A lot of these accessories are highly sought after as they were what car nuts from that time also wanted! A few summers ago I gave tours at a Revolutionary War museum that often hosted reenactors. They explained that the guys bring all sorts of non-standard items to the battlefield, just like the patriots did back in 1775. So long as you can show that someone during the war carried such a thing, it's fair game. That's how we continue to learn about the era and expand our understanding of history. I don't believe this is accurate. Graham Trippe started his company in 1922 and his lights were produced contemporaneously with classic cars through the 1940s (I'm not exactly sure when mass productive of the driving lights ceased). Trippes were eventually obviated by the advent of high beams becoming a standard accessory. Trippe than transitioned into lighting for emergency vehicles and eventually became a giant in the power AC/DC power inverter business. Oddly, "Tripp Lite" is now a giant in the IT world. I also don't know what an "authorized accessory" means. The questions we should be asking as restorers and collectors are "were they an available aftermarket accessory at the time the car was built?" and "were they commonly used?" The answer to both is yes. I just don't see the "grandfathering" argument here at all. These are not anachronisms or somehow historically inaccurate. They were extremely useful accessories a time when headlights were generally garbage at doing their job of lighting the road. The cabriolet has the highest survival rate of any L-29 produced. This car features optional Trippe Lights, Pilot-Ray Light, metal spare covers, and trunk. SAE described Borgeson as "one of the world's preeminent automotive historians." I don't think he would have included these items in his work on Cord if he thought Trippe Lights were inappropriate anachronisms on this car. I don't think the manufacturer's catalogs should be viewed as the definitive guide on what is historically accurate or not. Restoring a vehicle is not necessarily about following a manufacturer's original specs, but is instead about making the car period-accurate. It should noted that this is your opinion. Most clubs judge cars based on what the factory offered, or authorized its dealers to offer. However, that doesn't restrict owners from putting "period correct" items on their cars. I, too, appreciate seeing many of them (if done tastefully), however, owners do so at the risk of losing points. For many people that is not a deal breaker, but for those seeking top awards for their restoration, the accessories need to be proven to be factory authorized. The demand for Trippes fell with the advent of high beams, as all cars essentially had extra-bright lights built-in, but before that time they were a common sight for roughly three decades. Cord. You've made this statement more than once in your last several posts. It just does not make any sense to me. High beams had been in use for many years before the demise of Trippe Lights. Perhaps you meant the advent of sealed beams???? To say that Trippes, or any other accessory not listed in a catalog, doesn't belong on a true classic is to view history through a very narrow lens. You might as well throw out all non-sanctioned trunks on cars that only shipped with luggage racks, all custom-made tops, aftermarket carburetors, etc. And, indeed, club judging does deduct for non-authentic trunks. "Period Correct" is definitely NOT the standard for a proper restoration. Certainly not on purpose. However, the inclusion of the body style is what was needed in illustrating this particular page. I suspect that if a photo of a better example without the non-authentic Trippe Lights and extra license plates was available, he would have preferred to use it. That said, he may not have had the final say as to what photograph went into illustrating this page. That might have been up to the publisher. Borgeson only supplied the words. He was not known as a photographer, so I suspect that this photo was taken by another source. The topic of extra lights is interesting, and my observation is the longer you have been in the hobby, the less you want them. 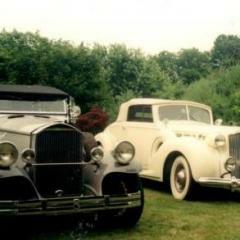 I just looked at photographs of one of the best pre war car collections in the world, the Bahre Collection in Maine. Not one of their cars has either style of lights on them, and only factory accessories can be found. Lights, mirrors, spot lights, wind wings, trunks, and other items mask and take away from the lines of most cars, and ruin the art of the original designer. Even when documentation of the car when new shows "lots of extra jewelry" and "add on's" when placed on a masterpiece of design, today on the concours field most are removed for multiple reasons. Ten and fifteen years ago, the circus wagon look was popular, today it's much more conservative, and in my opinion appropriate. The first thing we usually do after purchasing a car is to remove all the stuff, place it on a shelf, and we will pass it in when we sell the car. Not sure when "high beams" first became available but it was certainly pre 1930. Trippe Lights were primarily marketed to truck drivers. I guess this is why my dad only periodically entered his cars into shows, as it usually involved stripping away the items he though made the car look better. He's a stickler for keeping everything period-accurate and for staying within the confines of what was accurate for the manufacturer when it comes to the fundamentals of the car--paint, interior, proper drive trains, wheels, etc. But things like Trippe lights, Pilot Rays, trunks, bud vases in more formal coaches, fog lights, and other accessories just make the cars fun. 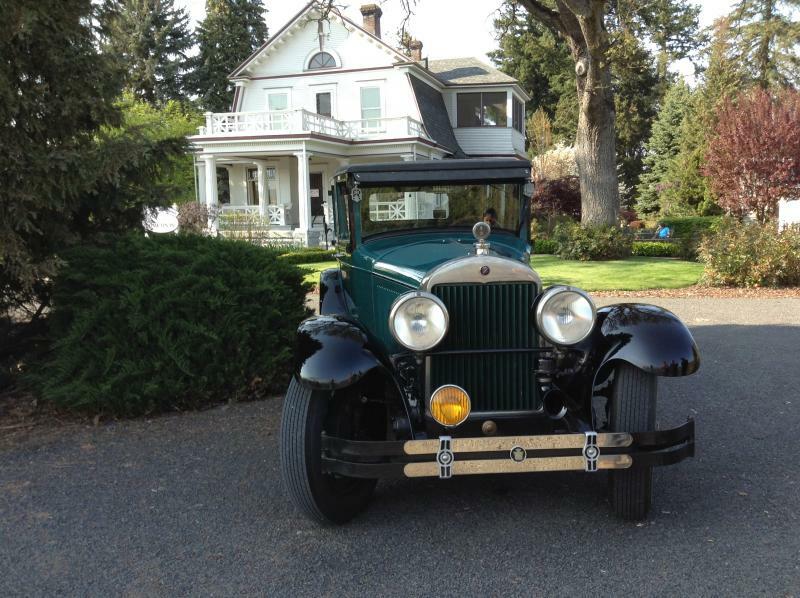 You get to pretend you're the guy who bought it in 1932 and then visit the local auto accessory seller and bought a set of Trippes, or even swapped out the hood ornament for something ostentatious and flashy. I'm totally against the idea of dropping an Oldsmobile V8 into a full classic or some other heresy like that, but bolt-on accessories just seem like good plain fun and not a perversion of the hobby. This is what "Tripp Lite" the modern version of the company claims. I'm not an auto historian, I was just raised by a man obsessed with classic cars. Okay. Now I understand. It's not unheard of that a company embellishes its history with incorrect facts. I do not argue that it is not fun, but if you are working toward winning a top award on a national level, it's more about accuracy than it is about fun (although those who participate at that level usually find it fun). There is nothing wrong with showing a car for fun at national events, and it's encouraged. I have done it, because my current car is not a contender for a First Place award. However, I did have it judged after I finished doing a lot of work to it, just to see how high up the ladder I moved it. Got a Second Junior. Now it goes back in as "Do Not Judge." The car itself is the trophy, and having fun is the reward. I can think of so many cars my dad has worked on that included after-market stuff, but stuff from the period, so I suppose I just see "accuracy" differently than the official standard. I would see it as something that would be realistically common at the time. 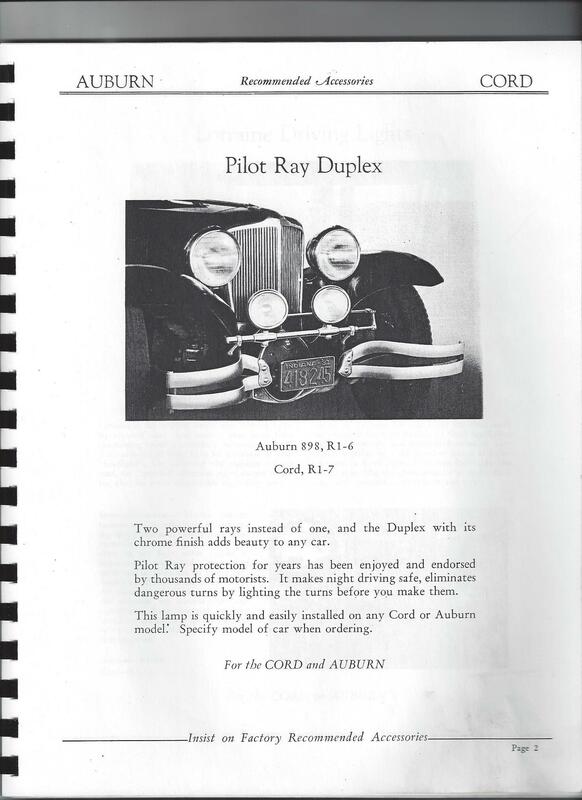 Whether or not someone in the marketing department at Chrysler or Buick struck a deal with Trippe Light in 1933 and included them as a "factory option" seems like a minor point compared to whether or not they were in common use. But like I said, most of my hands-on experience with history is in revolutionary war era stuff in New England and in some instances obscura is encouraged so long as you have iron-clad proof that someone would have used whatever the obscure piece is at the time. To me it seems like if Trippe Lights were common and in circulation at the time a car was made and in use, it's fair judge them with the accessory added. Does competition judging solely hinge on whether or not the original manufacturer would have installed component or offered it as a dealer accessory? That's obviously the strictest standard, a sort of "manufacturer perfect," but it strikes me that it's not the only possible objective standard.Another possible standard would be "period accurate." Under that standard, if a 1933 Packard has a 67 Chevy engine, it doesn't pass go, it doesn't collect $200. It's a hot rod, it's made up, it's just a one-off creation of the owner. That's okay, but it's not a "restoration" because it's not restoring anything to an objectively definable state. 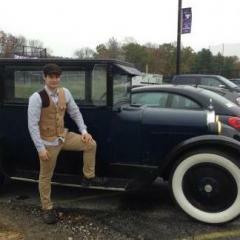 But a 1933 Packard with Trippes, or Pilot Rays, or Fog Kings, or some other after-market part like a carburetor, or bud vases, or whatever that was sold at the time is no longer a random beast, it's a car that you could have seen in 1933. If you can further prove that it was common at the time, through sales records or photos, than I would think that would be an acceptable standard. 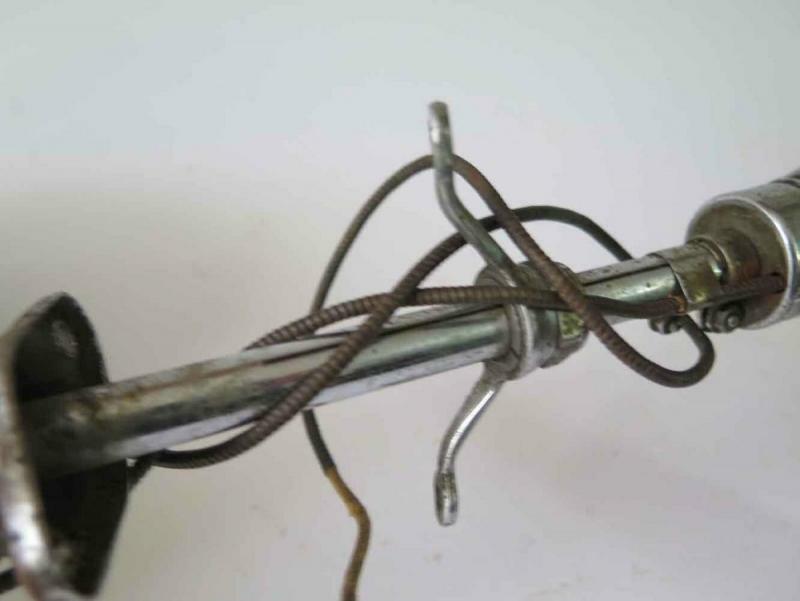 AACA only recognizes factory installed or factory authorized accessories. Period, end of story. All else being equal, I think a car with correct parts should be judged better than a car with incorrect parts. That's only fair. Some people don't drive their cars. The safety of original tires is not a concern. Some people will search the world for years to find the correct/original parts. That should be rewarded. If a participant chooses to drive his car, and add safer or more readily available parts, I think that's wonderful. But that enjoyment comes with a price. Sometimes you need to choose which game you want to excel at. Win shows, win races, enjoy driving, etc. It's hard to do it all with one car. This is a quote from the ACD Club website. I agree with Restorer 32. If a person 'back in the day buys a car then goes to Western Auto Supply, JC Whitney, Pep Boys or the like, shells out his money and hangs a bunch of do-dads on his car It may be era it may not be. How in the world are judges supposed to know that? The guys in the ACD club KNOW that Pilot rays came on L-29's and Auburns. Pilot Rays are OK Trippe Lights are not. " Period, end of story. " Factory documentation. Sorry to stumble into this thread so late. I kind of hesitated to comment but then said what the H... I own a senior emeritus CCCA full "Classic," that we finished restoring in about 1990. It was shown at a number of judged shows and subsequently invited and shown at Pebble Beach. There are no viable AACA judging events in our area of the country, so I can't compare your judging to the others. The comment was made that there was no points judging at PB, that was refuted by someone else, saying that points were indeed part of the process. In my experience PB has a modified French Judging format. Once driven from the polo field, to the eighteen hole area, in the early morning, there is no inspection done on any of the mechanicals. There is a judging team that arrives at your car, introduces themselves, walks around the car. I don't remember opening the hood, starting the car or checking lights windshield wipers etc. All members of the judging team shake your hand, indicate what a nice car you have, thank you for coming and leave. This is not what I had become accustomed to at any other judged event. IMO the car is judged on a combination of objective and very subjective factors. Where it is judged or by whom was not clear, but I have always wondered whether anything that happened on the field that day really made a difference. Points are a factor in the process. IMO previous judging events are what set the standard for cars considered for an invitation. My car was very well known before it was ever invited. They knew every show in which the car had been judged and how it scored. LT called me after each show that I entered to find out how it had done. He maintained a file on my car, as I believe that he did on most cars. Twenty five years ago the vast majority of cars were 100 point cars. There were some exceptions made for historically significant cars, or cars that fit the theme of the day. At the end of the day subjectivity rules in determining the best cars and the ones that are driven over the stage. what is the right light for me? Flat glass , drum bucket. Nickel plate bezel. Just a single on the r.h. side. Tell 'em you heard it from an old guy , who heard it from the old timers themselves. They referred to this usage as a "ditch light". If you live and drive in an area with ditches , aim the light slightly to the right. '20s roads , (or lack thereof) , don't ya know. Now , these are no where as easy to find as the other subject lights here. But you are young , you'll find it ! Place a "want to buy". I am very impressed with your determination, and passion for excellence. I have been following your trials with empathy and admiration. This question you have just asked is yet another example of your desire to learn , and learn right. There is no doubt that with all the knowledge and mechanical experience you are getting , plus your organizing tours , etc. you are becoming a real pillar of the hobby ! This ditch light was on my 1927 Cadillac when I got it. I do like it in a way. But it is just a little bit more modern than the car , so I removed it. This is not to say that no such car could have mounted such a light back in "the day". It is simply that said day could not not have been in the '20s. Now if you do happen across a perfect pair that the seller will not split , please get in touch with me ! I've noted that original Trippe and Lorraine lights use a armored wire of sorts. It appears to have been black, maybe brown when new. I have a few sample pieces left on lights I have. 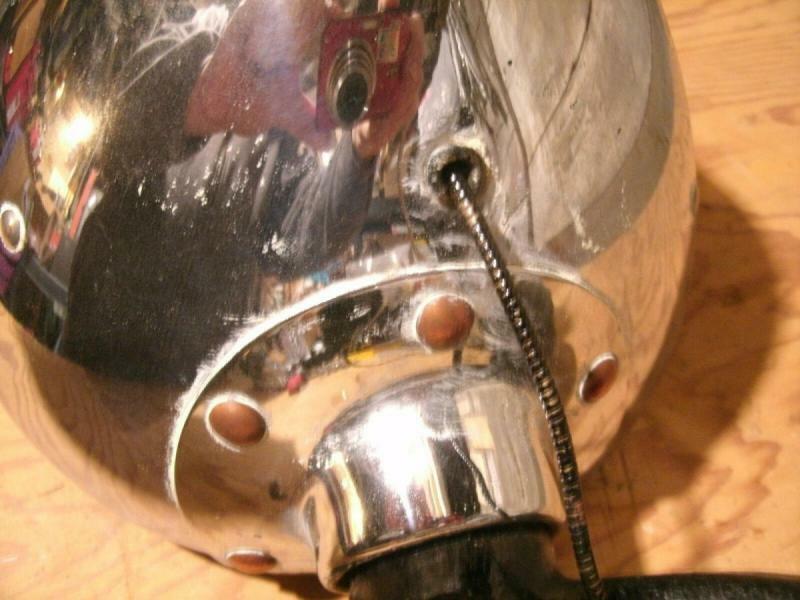 Can't tell if the wire was fed through conduit (don't think so) or if the armor is part of the wire insulation? Does anyone know a source for new wire with this pattern? 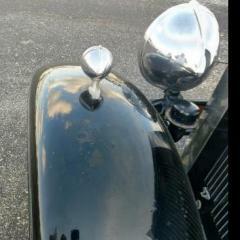 On a few restored cars, I have seen this replaced with a chrome conduit. 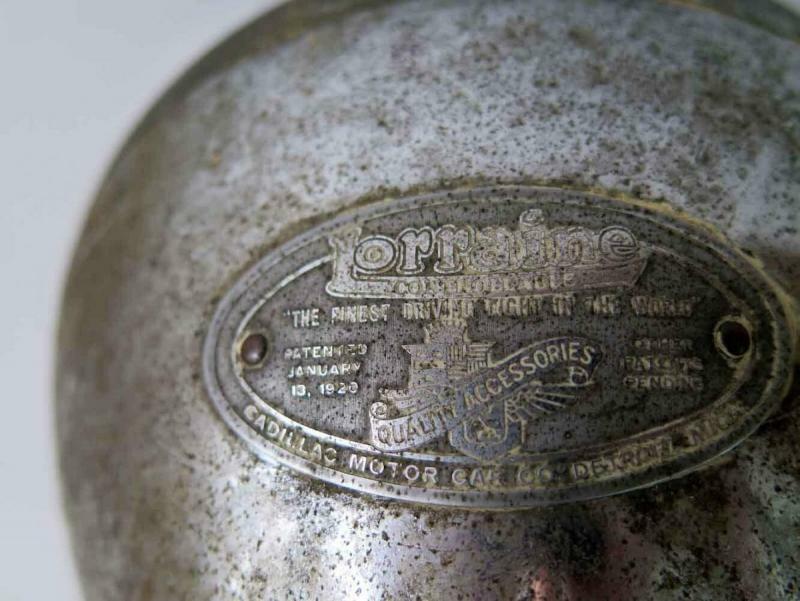 As an aside, I have a Lorraine spotlight with a tag on it with Lorraine markings as well as showing Cadillac Motor Co. Detroit - genuine accessories (or some such) with the Cadillac crest. Some Lorraine's just have the company name and model number it seems. 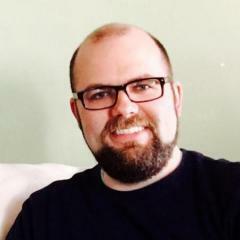 I've attached a few photos for reference.